The Runner | Vancouver Charity Asks Students to "Search for Jugaad"
KPU students with innovative ideas for making education more accessible abroad could soon be headed to India with $1,000 in their pocket. 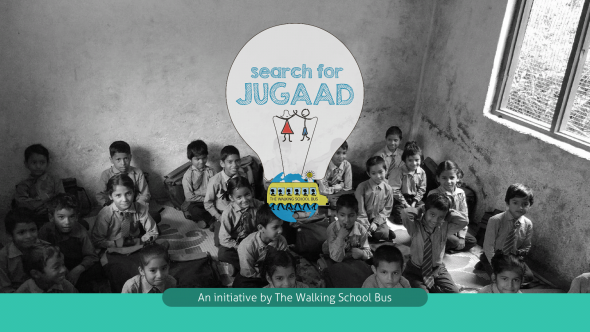 The Walking School Bus, a charity founded by Aaron Friedland, has launched a contest called “Search for Jugaad”, which encourages young and bright students to submit their best ideas for how to make education more accessible in Africa and India. A colloquial Hindi term, “jugaad” can be interpreted as “an innovative fix or an improvised solution born from ingenuity and cleverness,” according to the group’s website. Those who enter the contest are expected to submit an elevator pitch of their idea, which must pertain to improving access to education and should consider the charity’s pre-existing projects. The winner will receive a cash prize, a mentorship, and a trip to India to work with the Walking School Bus team this April. Aaron Friedland was a first-year student at McGill the first time he went to Uganda. There, he quickly noticed how long the schoolchildren in that country had to commute to get to school, often making multiple kilometre-long treks or hitchhiking their way to class. Friedland started the Walking School Bus to help improve the education system in these areas, adopting a research-backed approach to the organization that has now led to the creation of several initiatives such as solar powered classrooms and the school bus itself, which transports students to and from class every day. “When I was in the classrooms, something that routinely reverberated in my mind and that I could just not stop thinking about was that if I had grown up in that community, had I grown up in that school … I definitely wouldn’t have made it to high school,” says Friedland. Growing up, he suffered from dyslexia, but Friedland is now pursuing his doctorate degree at UBC. The expedition to India is optional for the winners of the contest. If they choose to go on the trip, they will be working with development practitioners, educators, students, professionals, and researchers on the ground in Uttarakhand, Northern India to bring their idea and WSB’s other projects to life. Right now, youth in the communities there walk between five and six kilometres per day to get to class through uneven terrain. The expedition team will be working in a total of three schools, one of which will only receive a water catchment system. Friedland says that students who are interested should be taking “20 minutes to four hours and writing their idea down and submitting it.” Two years ago, he submitted his idea to the Next Einstein Contest without expecting to hear back, but won the prestigious award and accepted it from Anderson Cooper in Toronto shortly after. He notes that the same thing could happen to a KPU student.